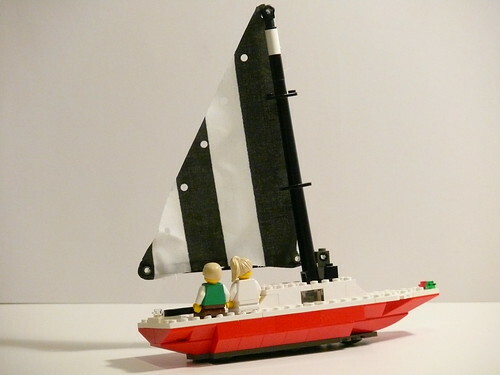 I built this LEGO sailboat to be a scale model of a 25 foot daysailer. It’s been built for a number of years and has appeared on BayLUG/BayLTC layouts when we’ve had a water scene. Click the image to browse the gallery on Flickr or view them all as a slideshow. LEGO Semi-Trailers made to go with my various tractors. Each one has a folding leg to support it when not connected to a truck, and all have the same interchangeable pin system for being towed. Click the image for the gallery, or view the slideshow. Cab-over semitrailer tractors made in LEGO. Identical except for color, these trucks have been a fixture on the BayLUG/BayLTC city/train layout for years, but I never got around to photographing them. Click the picture or view a slideshow. 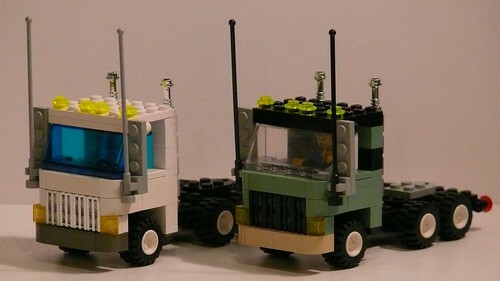 A double semi-trailer truck made out of LEGO, featuring tractor, two trailers, and a dolly to connect the trailers together. I built this a year or two ago and it’s been at a bunch of BayLUG/BayLTC events but has never been photographed and blogged before. Click the photo to view the gallery on Flickr or view as a slideshow. United States Postal Service trucks in LEGO. Designed by me in 2003, and featured on many BayLUG and BayLTC layouts since then. 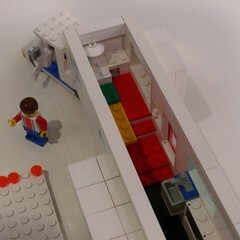 I posted instructions to build this in 2007 on Brickshelf, but never posted any photos until now (except of course for the occasional candid shot in a club layout). Click the photo to view the set on Flickr or view as a slideshow. 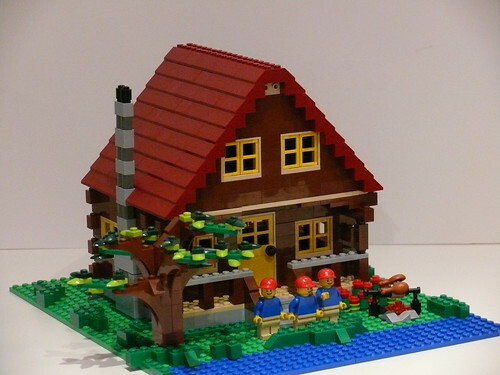 I built this many years ago (2003 or so?) but never posted it online before. It’s been on many BayLUG and BayLTC displays, though. I’m still fairly happy with it, though it could surely be improved in a number of ways. The trailer attaches via a Technic axle to a bracket in the truck bed, and is a “toy hauler” – it contains an ATV (All Terrain Vehicle) for off road fun. It has two slide-outs, one in the bedroom in the front and another with a dinette in the center. Click the picture to go to the gallery on Flickr, or view them as a slideshow. Admin note: Over the span of the next few weeks I plan to post a bunch of older models online. After Maker Faire I brought all the boxes of models that have never been posted into the house, and am slowly working through them doing photo shoots and blog entries, and in some cases to make LDraw files for building instructions. 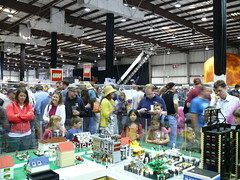 So while the quality of construction might not be as good as stuff I would build today, they’re still models I like enough to show at train shows and events like Maker Faire. I hope you enjoy them. Click on the picture, or view a slideshow to see all of the photos (including pictures of the cabin on display at Maker Faire last weekend). 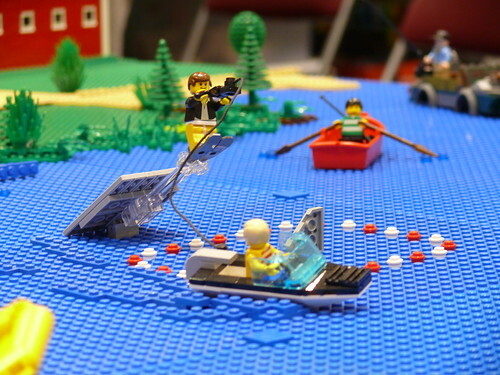 A couple of years ago I created this scene depicting the famous “Jumping the Shark” scene from the TV show “Happy Days.” Here, Richie Cunningham drives the boat pulling the Fonz on water skis as he leaps over a shark to prove his bravery. This is the origin of the phrase often used to describe the point where a TV series becomes lame. This has been featured in a few of the Bay Area LEGO Train Club displays over the past couple of years, and I have included some of those photos in the photo set on Flickr for this model. To see the pictures, click the image or view a slideshow of the pictures.